Every artist will tell you the importance of the space in which we go to be creators and makers. With your generous and steady support we were able to generate supplies and materials necessary to start our art studio. In result of our dedication to the class and to circumstance, the Buen Pastor has given us our very own studio space to retreat to for our class time. Thanks to our friend, Artist and educator, Rebeca Beeman, and many of your donations, we were able to participate in the Adobe Youth Voices program. 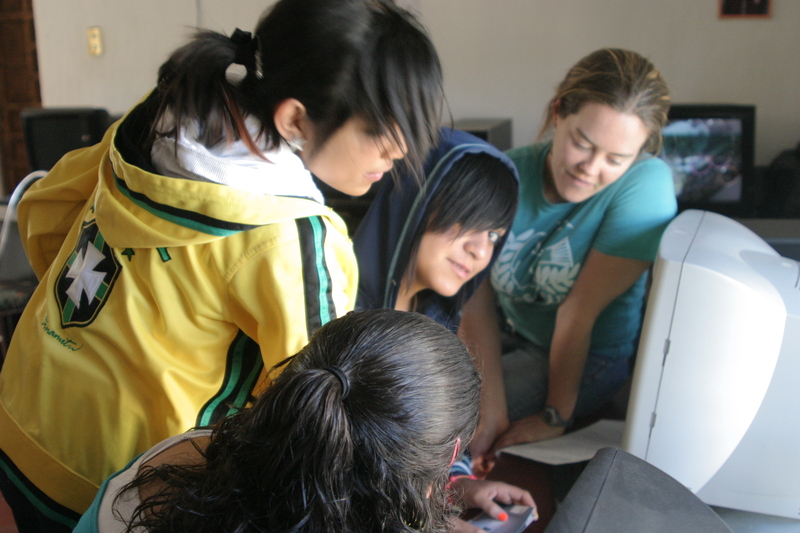 This relationship has resulted in the gift of a great Flip video camera and Adobe software on all of the computers in Buen Pastor’s computer lab. In addition to our work with Adobe, we were lucky enough to have local 3D animators, Octavio Mendez Sanchez and Claudia Hernández Ascensio provided us with an introductory course to Blender, a 3D animation software. And they were generous enough to install this program on all of the computers as well! ⁃	Digital Storytelling: Use of digital cameras, basic photography concepts, intro to Photoshop, intro to Blender, Story telling through imagery. ⁃	Identity and Relationships: Portraits and Self Portraits: Portrait process of famous North American artist, Chuck Close, Photography and portraiture, painting with acrylics, introduction to the art of stencils and continued writing component. ⁃	Story Play and Surrealism: Imaginative story construction (group and individual) based on famous Surrealist paintings, color mixing-primary & secondary colors, warm vs cool colors and complimentary colors, sharing of dreams and memories through drawing, painting and writing exercises. Throughout 2010’s workshops we have made an effort to invite artists from a variety of media and experience and nationality to join us. Dylan Williams, a successful painter raised here in Guanajuato, schooled in New York City, Rebeca Beeman, Photographer, media-maker and educator – North American by birth, but a life spent growing and learning throughout Central America and Mexico. Octavio Mendez Sanchez and Claudia Hernández Ascensio, 3D animators and educators from Guanajuato. This fall, Joelle and Jessica Terezakis migrated South from Canada with the Monarchs perhaps, and have served us in and out of the classrooms as loyal volunteers. Well Theatre Company and the Great wall of Books (Jodie Ahrens, Rebecca Conroy and Christie Stott) of Melbourne Australia offered a great experience to the girls through the Nuestras Historias mini-workshop. John Asbury Hunt, Carpenter and vagabond from Austin, Texas and Coco Callan, a painter (muralist) from Toronto, Canada. •	May: Dylan William’s Landscapes of Guanajuato: The class was very excited to take a field trip to el Centro to see Dylan William’s Landscapes of Guanajuato. The experience was especially interesting to the girls because we had an established relationship with Dylan as a visiting Artist and lead learner. The girls were full of comments and questions about the work! •	July: Our First Public Exhibition! We celebrated the completion of three separate workshops by inviting the public to an exhibition of some of our best individual work as well as the unveiling of our group self portrait, inspired by Chuck Close. 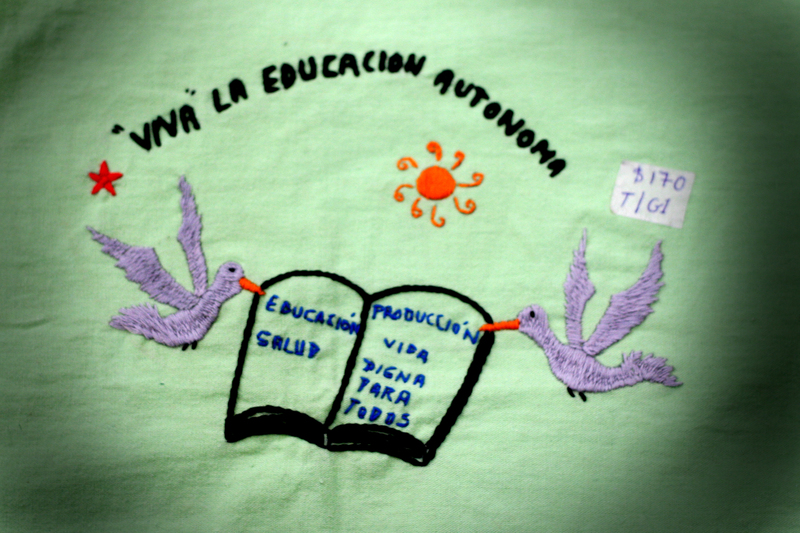 This mural was made to live at the Buen Pastor in the hallway where the girls live. •	August – Capture & Release: Benefit Art Show in St. Louis. Katie Clancy (Director of eStudio 473) returned to St. Louis for the arrival of little her niece, “Honey” Brown, as well as collaborate with Bad Shoe, a local literary publication that features the work of women writers and visual artists from St. Louis. Two series of Clancy’s photography were published as well as information about eStudio 473. The two worked together as well to plan and host a fundraiser, art show and reading at The Mad Art Gallery. The night was a great success for everyone involved and we so appreciate the dedication and generosity of the zine’s editors and founders, Erin Wiles and Elly Hergert as well as Ron and the gang at the Mad Art Gallery. 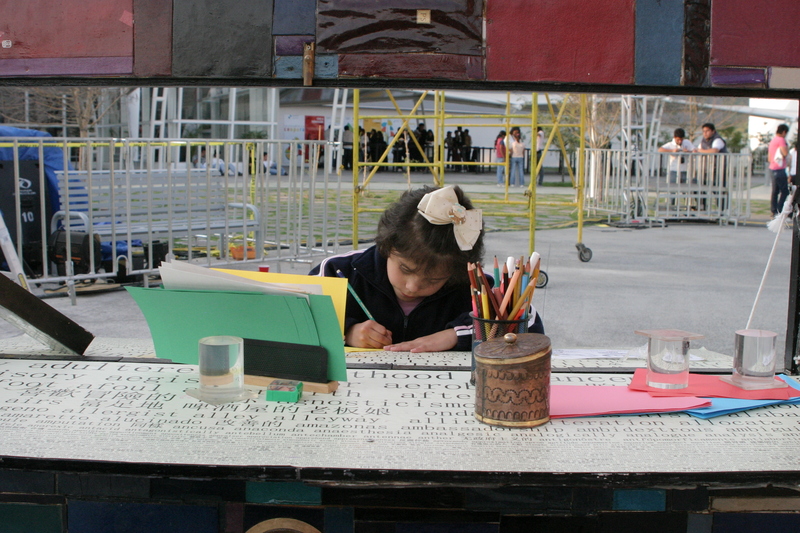 • October – El Gran Muro de Libros: The entire gang of girls living in the intornado boarded a bus and took a fieldtrip to the Expo: Bicentennario de Guanajuato to view and interact with El Gran Muro de Libros. The girls that participated in the mini-workshop Our History, displayed their artwork, came in costume as their featured historical figure and were interviewed on the radio show. Their audio biographies had been previously recorded and were included in the exhibition. • December – Story Play Tools: Throughout our fall 2010 workshop, Story Play, our main collective project has been the creation of our interactive mural (on the backside of an old chalkboard). We have also created “blueprints” for the puppet show that is now built and just waiting for us to paint it! 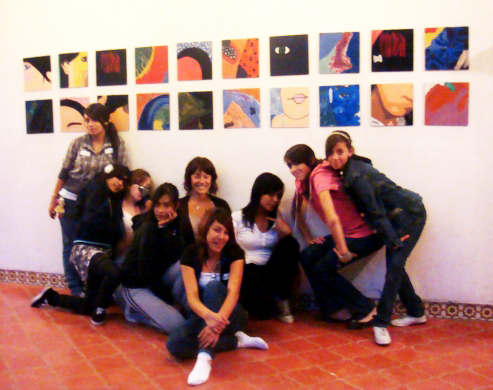 And our oldest group of girls will be working to create the walls and roof of our casita. 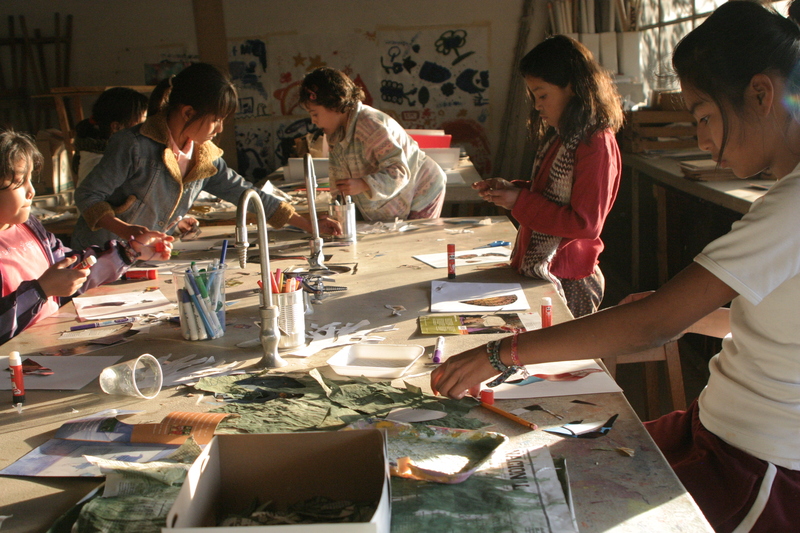 All three of these projects when completed, will live in the courtyard of the Buen Pastor and will encourage continuous exploration into story, dramatic play and cooperative, creative play. 13 Jan	This entry was published on January 13, 2011 at 4:30 am and is filed under Uncategorized. Bookmark the permalink. Follow any comments here with the RSS feed for this post.